The Victory Services Club (VSC) today re-opens its El Alamein and Trafalgar Suite following a £1.5 million investment to refurbish the space. The new space, with a capacity to host between 10 and 250 guests, will be used for conferences, awards ceremonies and corporate functions and will be supported by a state-of-the-art, high specification kitchen. The refurbishment has seen the suite fitted out with contemporary flooring and energy saving LED lighting as well as the latest audio visual equipment which includes wireless microphones, two displays that connect to AV wall plates and a Crestron control panel set up to regulate the technology for both rooms. As part of the refurbishment, the military members club has created two separate entrances to the El Alamein and Trafalgar rooms enabling the two spaces to be used together or independently, according to the requirements of the event planners and delegates. 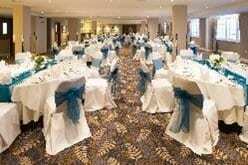 The newly refurbished suite will be showcased on Thursday 29th September at the venue’s VSC Vineyard event. Clients and event planners are expected to attend the evening showcase which will include wine tasting, food samples and a tour of the new spaces. The Victory Services Club (VSC) is a private military members club, located in central London near Marble Arch. Established in 1907, the venue has a capacity of 10-300 and can accommodate a wide spectrum of events, including conferences, meetings, exhibitions, receptions and award ceremonies. The Club is a registered charity that re-invests revenue from commercial events to fund schemes, including breaks for injured members of the Armed Forces, veterans and their families. The Club was the first London venue to be awarded the Meetings Industry Association (MIA) AIM Gold accreditation in 2008 and still maintains this status today. The VSC has also achieved Hospitality Assured status, the quality standard created by the Institute of Hospitality for customer facing businesses. The VSC upholds three key values, which embody its ethos – value, service and courtesy. These values are adopted throughout the organisation and are at the heart of service delivery. Further information is available at www.vsc.co.uk or via Twitter @VSCvenue.